The brand new heart-warming romance from the Sunday Times bestselling author of A Country Escape and A Secret Garden. *** Caro Swanson has taken a job in a remote part of Scotland. She's answered an ad in The Lady: being a companion to an elderly gentleman who lives in a country estate could be perfect! Surely it is time to make a change and do something different for a while? The fact that she may also see Alec, the young man who she met some years previously and who she has always thought of as her `one who got away', is of course purely incidental. Soon Caro is falling in love - not only with Alec but with the stunning house and grounds she is now living in. But the estate is in financial difficulties. and it quickly becomes apparent that there is only one way to rescue it. So begins a magical romantic summer that will take Caro to London to the south of France and back again to Scotland in search of a classic lost perfume that might just restore all their fortunes. Romance, humour, a cast of warm and totally believable characters and the possibility of happy-ever-after lie at the heart of Katie Fforde's wonderful new novel. 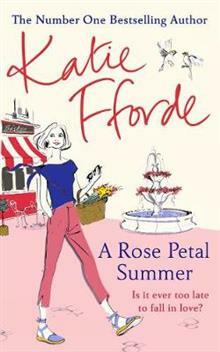 Katie Fforde lives in the beautiful Cotswold countryside with her family, and is a true country girl at heart. Each of her books explores a different profession or background and her research has helped her bring these to life. She's been a porter in an auction house, tried her hand at pottery, refurbished furniture, delved behind the scenes of a dating website, and she's even been on a Ray Mears survival course. She loves being a writer; to her there isn't a more satisfying and pleasing thing to do. She particularly enjoys writing love stories. She believes falling in love is the best thing in the world, and she wants all her characters to experience it, and her readers to share their stories. To find out more about Katie Fforde step into her world at www.katiefforde.com, visit her on Facebook and follow her on Twitter @KatieFforde.